Our Nursing Directorate’s vision is to provide quality nursing services. We are committed to high level health care provision, continuous nursing education and development. Nurses in Hygeia hospital play a pivotal role in delivering quality health care services, focusing on patients’ needs. The model of patient-centered care focuses on identifying patient’s needs and on creating a supportive, caring environment. Our priority is the implementation of a patient approach, based on respect and interactive communication between all healthcare professionals. creation of a dynamic, quality environment which combines nursing theory and practice. provision of safe and high quality nursing care to patients. continuous commitment in nursing recruitment and retention, in one of the most rapidly developing hospitals in Greece. The aim of the Nursing Supervision Office is to coordinate and monitor the performance of all nursing departments so that nurses may provide state-of- the art integrated care to all of HYGEIA Hospital’s patients. The Office ensures the presence of a secure environment for patients, visitors and HYGEIA employees. The Infection Control Office duties and competences are in line with those of the Infection Control Committee. The aim of the Infection Control Office is to plan and coordinate activities which actively contribute to reducing the spread of hospital infections, and protecting patients, visitors and the HYGEIA employees. The Infection Control Office focuses on active implementation of scientifically documented epidemiological principles and methods. Compiles Infection Control procedures and protocols, in agreement with the Infection Control Committee, and supervises their implementation. Plans the education and training of all employees on infection prevention and control, focusing on the proper use of personal protective equipment when implementing universal precautions, contact precautions, droplet precautions and airborne precautions, as well as on the proper implementation of the hand hygiene rules. 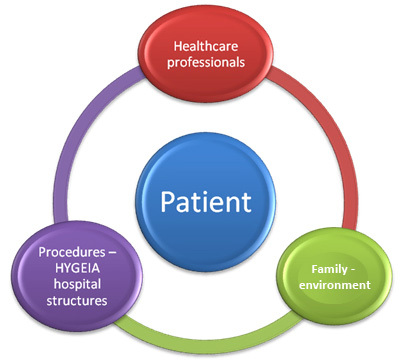 Uses contemporary tools and methods to assess risks, but also plan and implement the Hospital’s annual program for infection prevention and control. Participates in preparing the Internal Regulation on infection prevention and control. Uses contemporary tools, such as care bundles, to prevent certain types of hospital infections. Monitors continuously the types of hospital infections and the early detection of potential hospital epidemics. Coordinates and guides the activities of Infection Control Nurses Unions. Plans and carries out educational programs, such as a two-day seminars on the main principles of infection prevention and control. Conducts audits using infection control audit tools. Schedules and carries out the annual flu vaccination program for healthcare professionals. Plans and implements part of the program for patient, carer and visitor education and training. Contacts the proper state agencies and submits reports on predefined events. The campaign aims at assisting healthcare professionals to limit the risk of spreading germs and subsequently transmitting infections, through informational and educational actions. At HYGEIA, we believe that the simplest and most effective way to reduce infections is by properly implementing the hand hygiene rules. That is why we try to provide information and raise awareness, mainly among healthcare professionals, daily. Hand hygiene should concern all of us! Every year, we organize a series of actions addressed to the medical and nursing staff, other healthcare professionals (technicians, physiotherapists, trainees, maintenance employees, etc), as well as patients and visitors. Apart from raising awareness, we aim to create a trusting environment and gradually solidify a mentality that promotes safety, with the ultimate objective being to assist healthcare employees in reducing the risk of spreading germs and subsequently transmitting infections. On May 5 each year, we distribute informational pamphlets, while qualified medical and nursing staff inform employees and patients/visitors on the significance of hand hygiene. Special hand sanitizers are also placed at the Hospital entrance for visitors. At our Hospital, we try to ensure that all employees do not omit to wash their hands with soap and water or disinfect them with hand sanitizers before coming into contact with patients. We also urge visitors to do the same. We believe that the simplest and most effective way to reduce infections and the transfer of pathogens is by properly implementing the hand hygiene rules. We focus on the significance of improving hand hygiene in healthcare facilities and as a way of life for each and every one of us. We train our hospital employees daily. We inform patients and their visitors on the importance of hand hygiene and how to clean their hands properly. To ensure convenient hand hygiene, we have placed special hand sanitizers throughout the Hospital. Since 2014, we have adopted more actions that promote hand hygiene among patients and visitors. As part of the campaign, patients receive information on hand hygiene and are encouraged to ask the staff about the significance of hand hygiene and how to participate in the activities. The nursing staff all wear stickers with the message “Ask me about hand hygiene”, distribute relevant material and give advice on proper hand hygiene practices. Continuous nursing education is a high priority of the Nursing Directorate in HYGEIA Hospital. As early as the beginning of the century, when nursing science started to develop, it was recognized that Nursing Institutions are in need of distinct services in the aim of providing continuous clinical nursing education. The Nursing Education Office combines provision of continuous theoretical lessons in conjunction with clinical training (on the job training). Specialized programs per department, continuously up-to-date applications, active participation in quality accreditation programs. Greater satisfaction from the nursing profession and the organization with continuous educational programs. Acknowledgement of the professional status and the responsibility of the nurse’s role. High level of nursing knowledge and competencies. Orientation and educational programs of Nurses, Assistant Nurses and Orderlies. Continuous education of all nursing personnel via seminars, conferences, clinical tutorials etc. Continuous clinical education of all nursing personnel under real time conditions (on-the-job training). One-day conference for Anesthesiology Department Nurses. New Nurses in HYGEIA Hospital, participate in an organized orientation program which focuses on recognizing and developing nursing skills. A general orientation program within the Nursing Directorate, performed in collaboration with the Human Resource Department. A specialized orientation and educational program in any Nursing Department, being planned and carried out by the Nursing Education Office. Duration of the orientation varies with the department whereto each worker is placed.